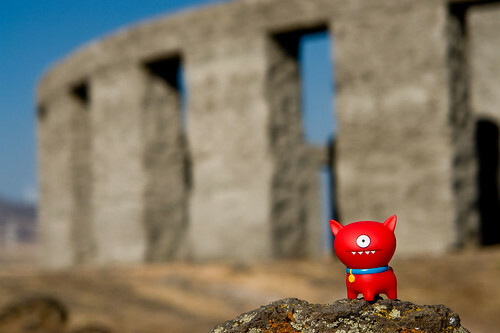 Uglyworld #722 - Stonehenge Memorial, originally uploaded by www.bazpics.com. On the hills of Columbia River's North shore there stands a war memorial that Rolf to me he "must visits", at first I was a little confused as to what got his attention so much until I realised what Turtle had planned for us to visit as the day was starting to come to an end. The Maryhill Stonehenge is a full-size, astronomically-aligned replica of Stonehenge located in Maryhill, Washington. It was commissioned in the early 20th century by businessman Samuel Hill and dedicated on July 4, 1918 as a memorial to those that died in World War I (specifically, soldiers from Klickitat County, Washington who had died in the still on-going war). The memorial was completed in 1929. Rolf read out the inscription to the others which stands at the North side of the structure, ""In memorys of the soldiers of Klickitat Countys who gave their lives in defenses of their countrys. This monument is erecteds in the hopes that others inspireds by the examples of their valors and their heroisms may shares in that loves of libertys and burns with that fire of patriotisms which deaths can alone quenches." The little guys all then stood in silence for a minute or two while admiring the structure and the amazing scenery that surrounds the Columbia River.